Having failed to catch a crucian carp during my previous visit of just under two weeks ago, I was sure this outing would be more successful. 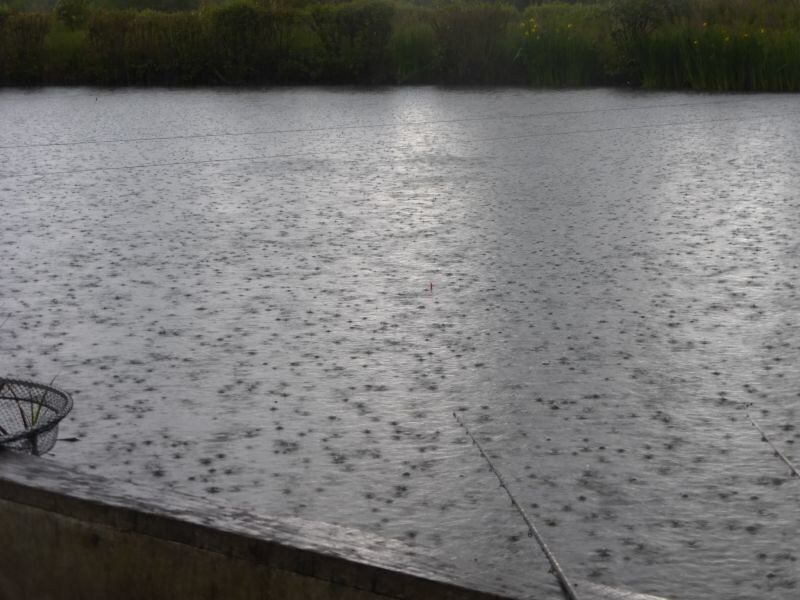 After all, Marsh Farm, Harris Lake, as per the web site, “famous for crucian carp”, and having caught nearly a hundred of them last season, my last outing must surely have just been a blip on my success rate. 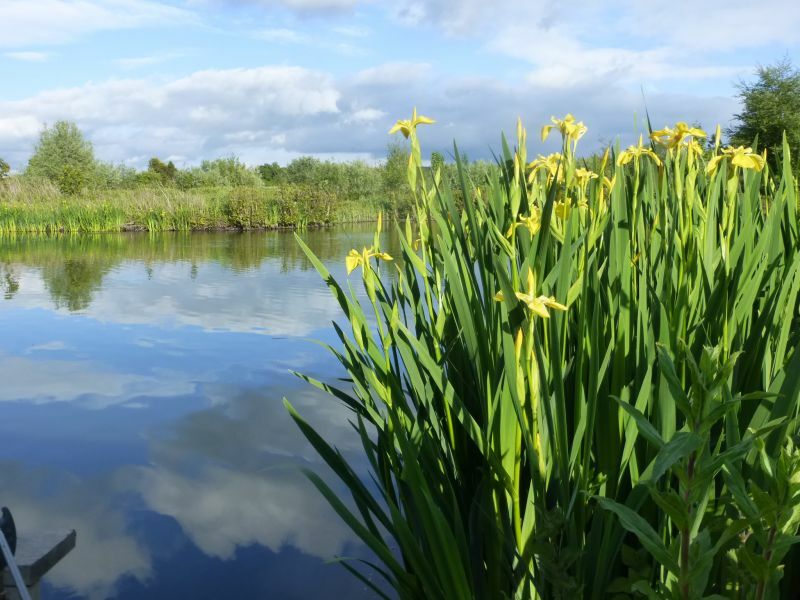 To further increase the odds in my favour, I was here for the night, and the hours of darkness are usually guaranteed to bring a crucian or two on the feed. Whether I would actually be able to stay awake for the night would remain to be seen. For the first time I had brought my barrow to carry my gear round to the chosen peg, about 400m from the car park. Last season I had been fit enough not to require this, but the cancer, and the treatment were taking their toll and I wasn’t as fit as 12 months ago. Setting up in the afternoon sun was very pleasant, but even though it was currently warm and dry I chose to get my overnight shelter up. One of the side-effects of my treatment is fatigue and taking this into account the large pile of equipment included a sleeping bag, with strict instructions from my wife, Kim, to use it !! I sometimes think cancer has a bigger impact on those around than it does on the patient, I can’t even try to fathom the amount of confusion, frustration, and fear that goes through the minds of Kim and my daughters, Clare and Emma, let alone the rest of my family and friends. The latest cancer statistics (2011) show over 330,000 new cases were diagnosed in that year, I wonder just how many readers of this blog know someone (me excluded!!) with the disease? Of that number, just over 10,000 were kidney cancer, and despite my predicament, as I like statistics, I can’t help but think where I fit into those for 2014 ? 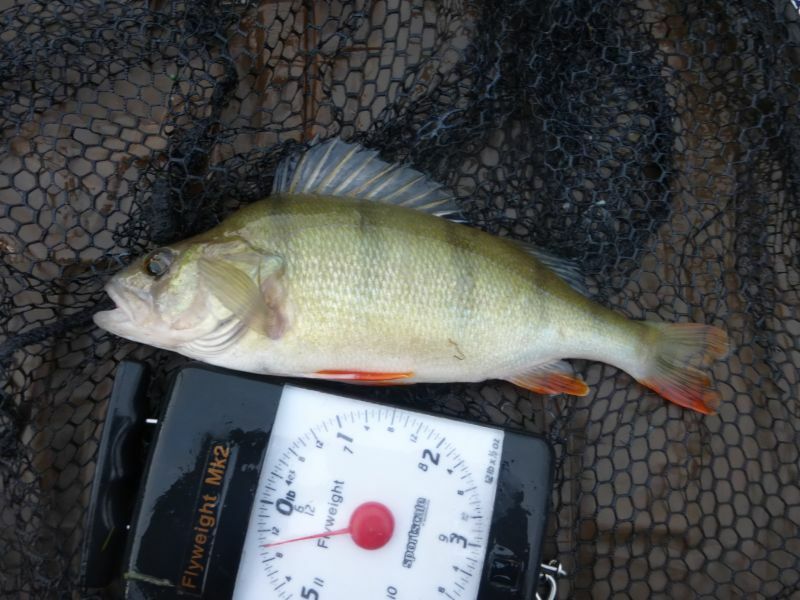 Anyway, in the sunlight the crucians hadn’t yet decided they were hungry, however some of the other residents in the lake were, including this little perch of 11oz. Across the lake to the east I could see some ominous looking clouds heading in my direction and it was a good thing the shelter was up, as within a few minutes of being sighted, they were overhead. My geography lessons from school gave me the skills to identify the grey fluffy things as nimbus….rain clouds. Okay, so the drops of water spattering my shelter from height helped this detective process somewhat. A few random spots of rain began to fall, shortly followed by a lot more of them! Fortunately the shower was just that, and within 20 minutes the weather had calmed down again, leading to a very nice mild evening. Throughout the night the tench and my kettle kept me busy and awake, enough to keep me out of the sleeping bag with several five minute naps being sufficient. The mild damp conditions although pleasant for a night sitting by the lake also encouraged one of my favourite creatures to be out and about….slugs….yuk….hate the damn things, especially when I find one sliming its way up the front of my coat! It is only in the last few years that I have switched from taking just a flask to carrying a small stove and kettle, one of the best upgrades I have ever made. A mug of freshly made steaming hot tea, in the depths of night, is so much better than the luke warm contents you get out of a flask made up over 12 hours previously. Just after my third mug had been enjoyed, well, it had been once I had evicted the slug from the handle, I had a tench on both rods at the same time. Bringing both fish in, at the same time, on my own, and in the dark, made me appreciate those times when I’ve been able to call on my regular fishing companion and best mate, Chris, to give me a hand. Although I acknowledge it is usually me giving him the hand with the netting process and not the other way round ! 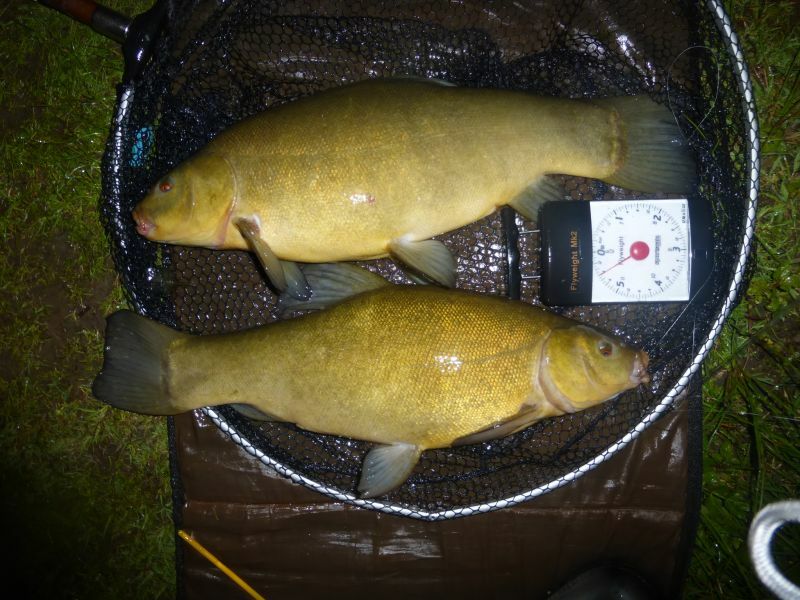 Over 10lbs of tench in the net, pity it wasn't just one fish though! These days the first entry on my list of things to make sure I have packed into my various bags is, tablets. On top of those for my blood-pressure, I also have my painkillers, several different flavours, and those for my cancer treatment, Pazopanib. Most of these are taken early morning, an hour before any food, although I also have an evening top-up of the slow-release morphine. Fortunately, the dosage of these is low enough that I am still allowed to drive, as I think I would be near on suicidal if I couldn't get out and about without pestering one of the family for a lift! After 12 months on the treatment for my cancer I still struggle with the pronunciation, so they are known as Pazowotsits in our family. These are described in the trade as tyrosine-kinase inhibitors, and they work, hopefully, and very simply, by blocking tumour growth. I take 600mg a day, and the two scans since starting the treatment last May appear to show the stuff is working. If the side effects are anything to go by, then I am hopeful the cancer cells are having as much fun as I am at times! I’ve seen some spectacular sunrises when out fishing, but unfortunately the one I sat though on this morning didn’t get anywhere into even the top 200. It kind of just went from cloudy and dark to cloudy and light and that was it, maybe next time! 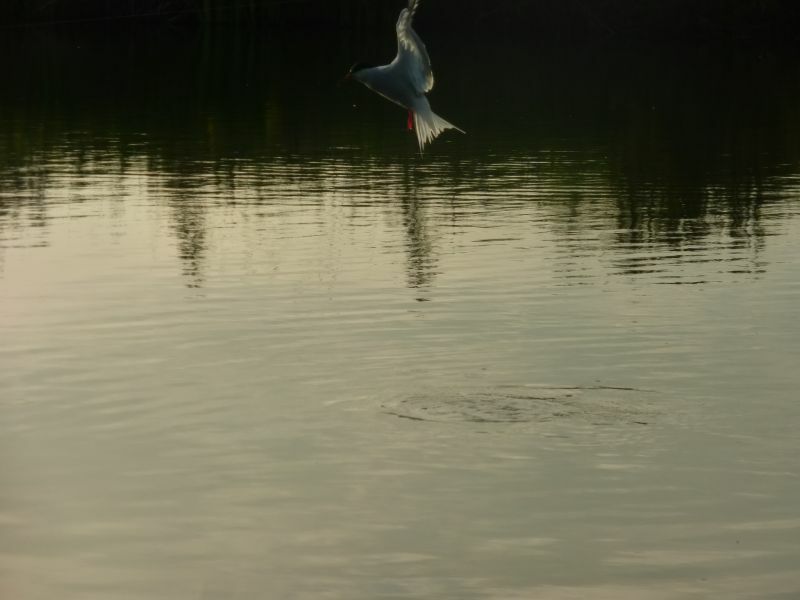 The fishing slowed down with the increasing light levels and I was happily distracted by trying to get a picture of a tern swooping down to take insects off the lake surface. These birds are so fast, a quick hover, a dip down, and then they are away. Twenty or so snaps later, this was the best I could get. With the thought of a cooked breakfast and then some sleep at home, I packed up, fourteen tench, plus a couple of perch and rudd was a good score for the night, but yet again no crucians! 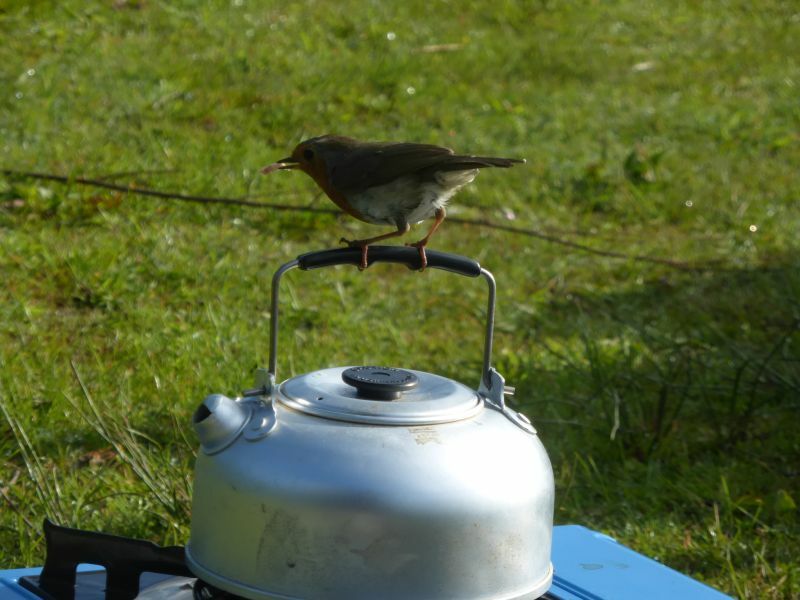 Maybe the robin which decided that my kettle made a good perch could provide some insight !! Another great entry Paul! Couldn’t agree more about the fresh brewed tea, first thing in the morning it really sets the tone for a great days fishing no matter how it actually turns out. I’ll have all I need for an overnight session pretty soon so will be in touch. To be honest I wouldn’t mind at all just catching tench, never had much success with the lift method and it looks like a good venue to practice. Good that the medication is working and even better that you’re not letting the treatment dictate your lifestyle. Pushing along a baggin’ up barrow is a small price to pay. Thanks very much for your comments Rusty I look forwards to fishing with you, its been a while ! Thanks for the blog Paul and appreciate your thoughts. I would need a sit down after only one of those tench.